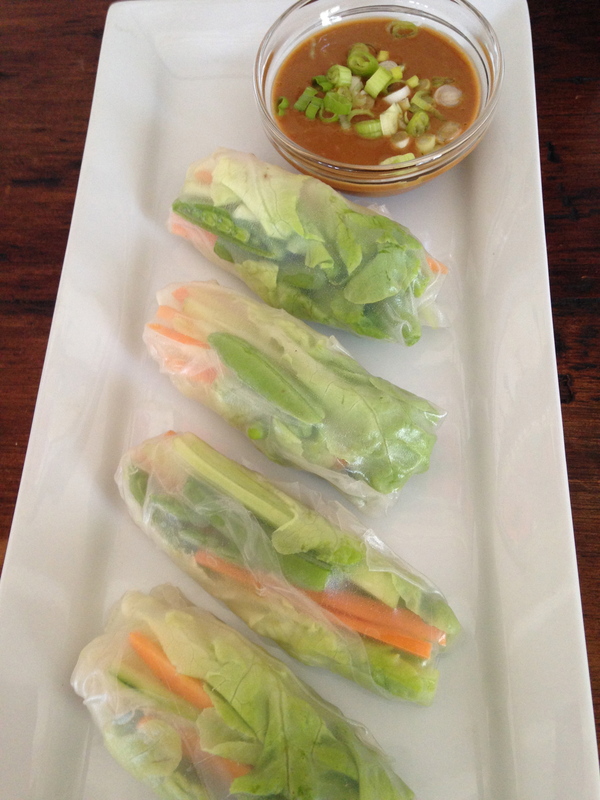 I have been wanting to make these spring rolls ever since my friend Barbara Mendez, from RootsandSeeds.com, posted this video but I had a hard time finidng the wrappers. Finally! And just time for the fresh produce from the CSA. These could not be easier to make and are really a great summer appetizer for a party, a Sunday snack, or a great excuse to make a peanut dipping sauce! We dipped every single bite! Prep the veggies. Julienne the carrots. Peel and deseed the cucumber and then julienne it. Trim the ends off the sugar snap peas and cut in half. Remove 8 pieces of lettuce from the head of lettuce and triple wash. Fill a big bowl or plate with warm water. Place a wrapper in the water and move around until completely soft. Move to a clean work surface. 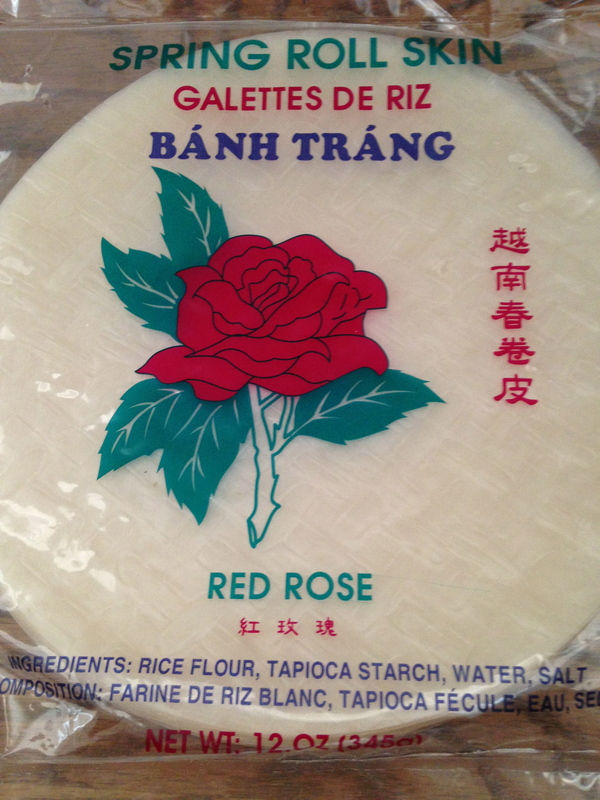 Place the lettuce leaf at the closest side of the rice paper to you. Add carrots, cucumbers and snap peas. 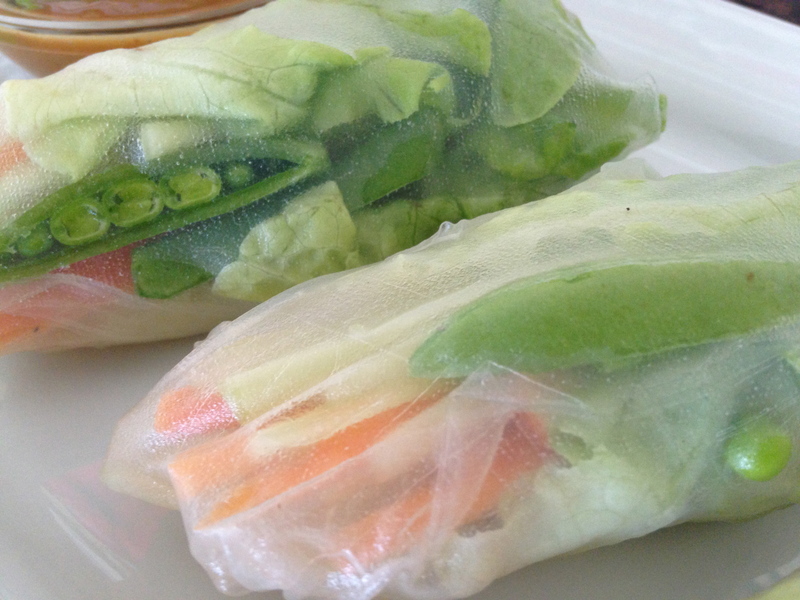 Gently pick up the rice paper right under the lettuce and roll it over the lettuce bundling the veggies inside. Then fold in the sides (like rolling a burrito) and then keep rolling until it is done. Repeat for each one. Whisk all ingredients together. Pour into a small bowl and garnish with the scallions. These look incredible. I am sucker for anything peanut-buttery — and a fan of everything raw! Will definitely make these this week. Thanks, Lisa! These look incredible! I am such a sucker for anything peanut-buttery — and a fan of anything raw! Will definitely make these this week. Thanks, Lisa!